Falkreath is a city in Falkreath Hold, located near the border with both Cyrodiil and Hammerfell. In the past Falkreath was considered a part of Cyrodiil, but now sits firmly within the borders of Skyrim. 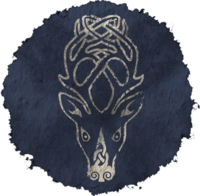 At the time of the Dovahkiin's arrival in Skyrim, Falkreath is aligned with the Empire. 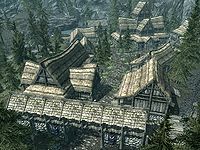 Falkreath's economy is centered around lumber retrieved from the surrounding forest. Its most distinguishing feature is its large cemetery that houses generations of the dead from all over Skyrim. Many shops in town derive their names from their close proximity to so much death. For more information about Falkreath, see the lore article. * Only after completing Moss Mother Cavern. Dengeir of Stuhn Dengeir's House Dark Ancestor: Destroy Dengeir's risen ancestor, the vampire Vighar. Esta página foi modificada pela última vez à(s) 00h20min de 27 de dezembro de 2015.